An innocent math professor runs for his life as teams of hitmen try to prevent publication of their government's dark history. 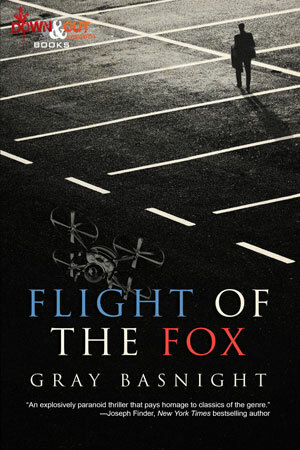 TAMPA, Fla. - March 29, 2018 - PRLog -- Down & Out Books is pleased to announce that FLIGHT OF THE FOX by Gray Basnight will be published on July 23, 2018 in trade paperback and ebook formats. That begins a terrifying flight from upstate New York, to Washington, to Key West as Teagarden must outfox teams of hitmen equipped with highly sophisticated technology. While a fugitive, he races to decode the journal, only to realize the dreadful truth—it's the reason he's being hunted because it details criminal secrets committed by the U.S. in the 20th Century. If he survives and publishes the decoded diary, he'll be a heroic whistle blower. But there is no guarantee. He may also end up dead. Gray Basnight worked for almost three decades in New York City as a radio and television news producer, writer, editor, reporter, and newscaster. He lives in New York with his wife and a golden retriever, where he is now dedicated to writing fiction. Celebrating seven years as an independent publisher of award-winning literary and crime fiction, Down & Out Books (https://downandoutbooks.com) is based in Tampa, Florida. For more information about the book, to request a review copy of the book, or to inquire about an interview with the author, contact lance@downandoutbooks.com.